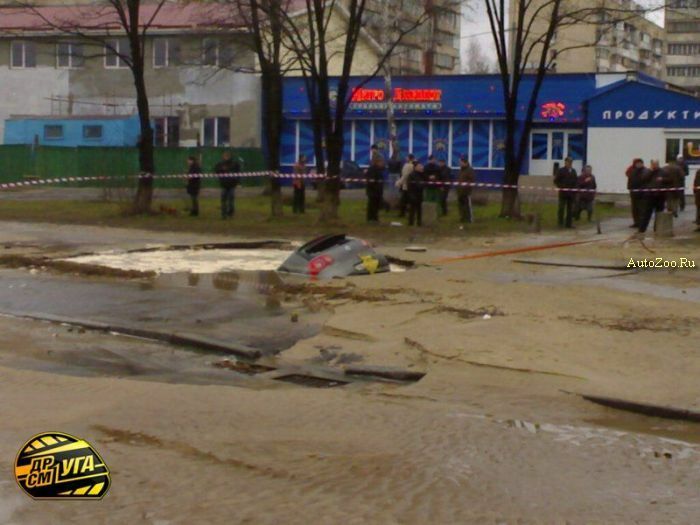 This VW didn’t get underwater, it got under road, as such thing can happen only in post Soviet space, this time in Ukraine. The people had to escape through the bagage door as it was the only part of the car not under the road. Hi Miss India,how have you been doing lately? 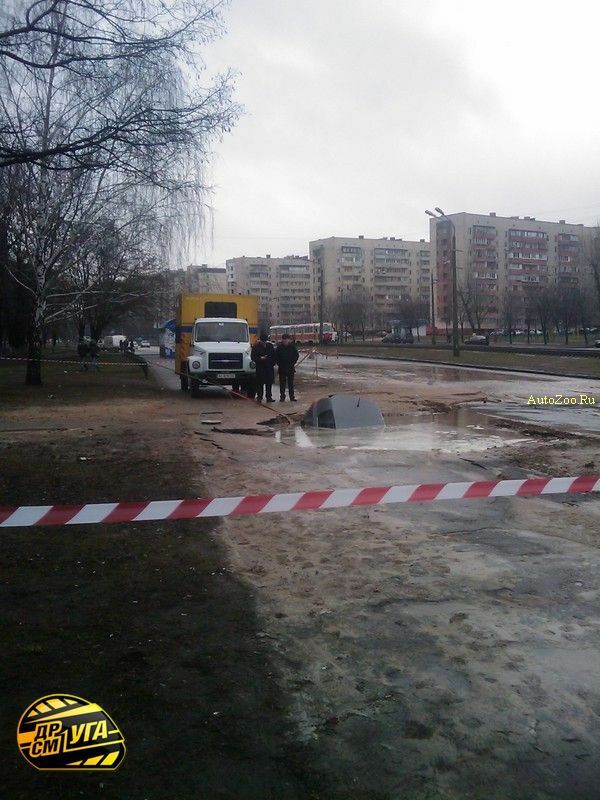 If it was not for the cable holding that car it would go deep-sea diving in that puddle. Hey, it’s not the “bagage door”… it’s a liftgate ! I’m surprised that you could drown by sitting in your car in the middle of the road several hundred miles from a water source. 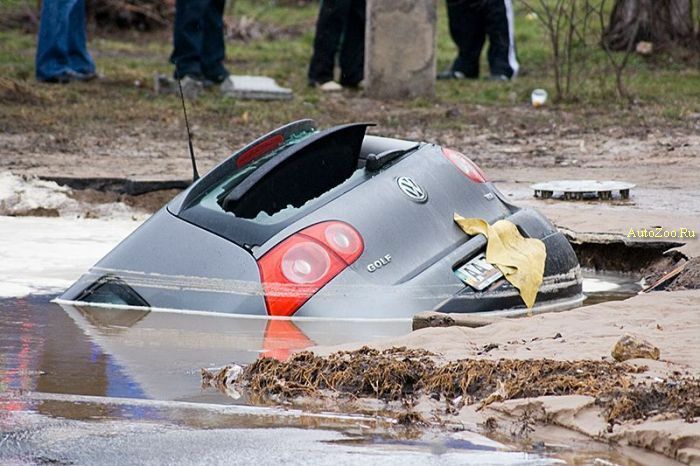 Local officails fined driver of VW. They say he recklessly drive car too hard and broke road. He will think about driving softer next time. I stayed in Russia for a month 9 years ago when I adopted our son. This picture certainly brings back memories. I imagine by now, the disabled gentlemen I met in Russia, is no longer able Get to Church because of the conditions of the roads… and this picture is from a larger city, he lived in Glasov, which is 18 hours on the Siberian Railway from Moscow. We traveled from Glasov to Ijvesk, on roads we weren’t certain would be there on the way back. 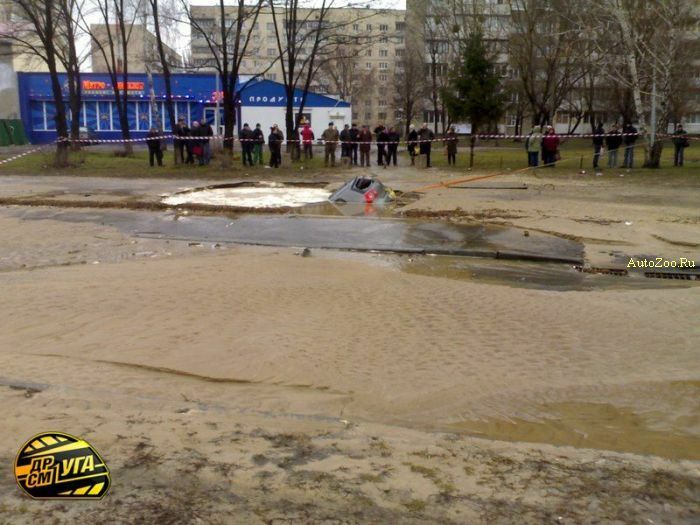 Russian gives a whole new meaning to the “potholes”. 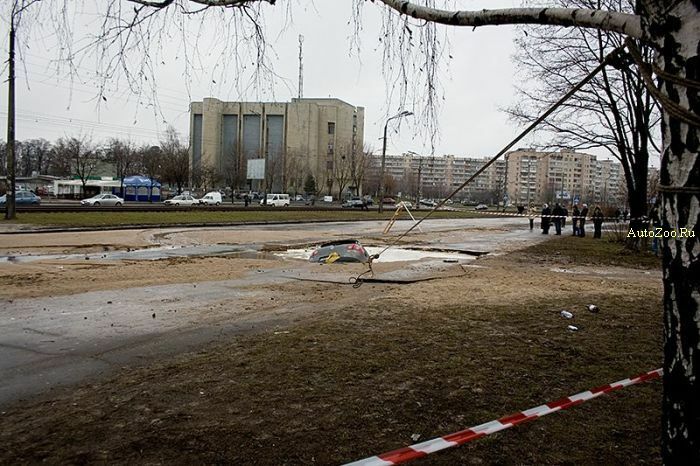 In reference to this poor driver, please see my comments in the “Soviet Racing” post, especially the part about the crash helmet, which I hope these Ukrainian drivers had. Probably they didn’t, since there are not many high-mountain sheep in Ukraine, except for a few in the Carpathians, but even they are of a breed which has softer, less bristly hairs on the outside of their testicular bags, and therefore not as stimulative or effective as those of the Zagros breeds. 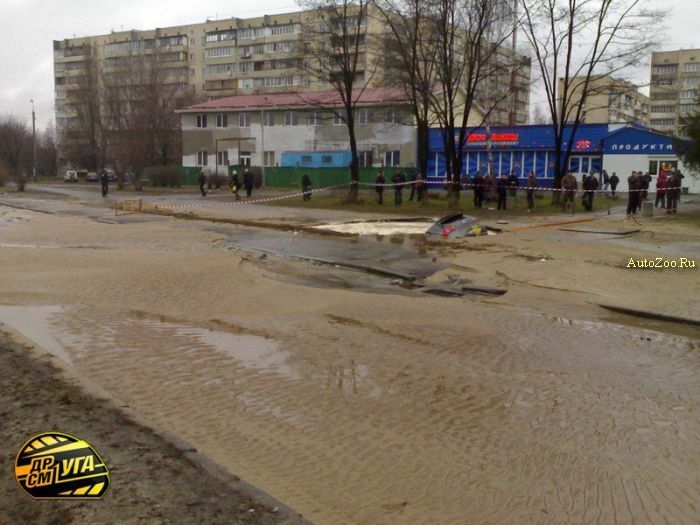 OMG, Russians are so rich, they build pools on their roads and they put cars in these pools. Wherever it happened I believe somebody has got an incredible luck. 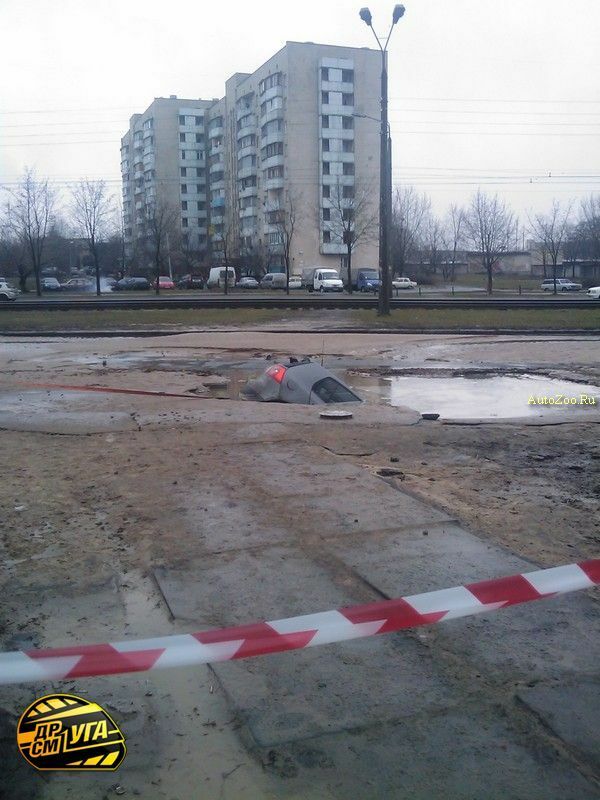 Just guess what happened if his car would completely fit to the hole including a rear part making people trapped inside. 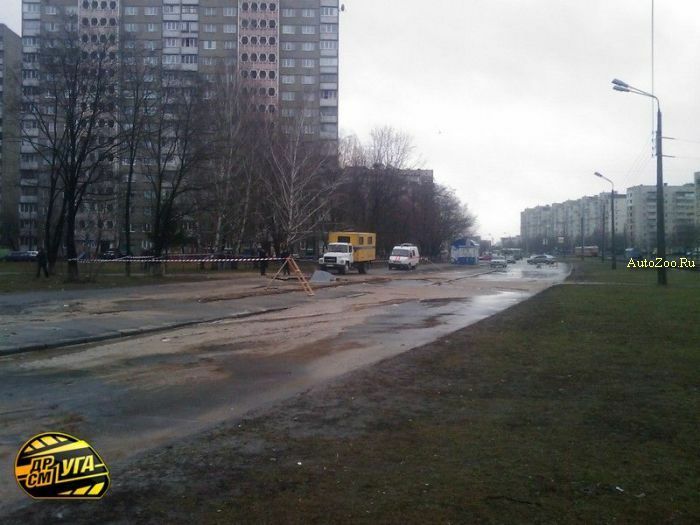 Judging from the street drain nearby, I think the sewer pipe collapsed underneath the pavement. Ohh, just thinking about the smell…ugh! Even a detailing shop won’t be able to fix that! watch what’s going on in your Capitalistic space.Developed nation blin. Nice post. Thanks for publishing this. Keep up the good work.